See the museums and attractions in the city: Sydney City Map of Where to Go, What to See and Places to Visit. Note: There are free shuttle (green) bus services that operate in Sydney city center, Parramatta and Wollongong. They operate in a loop to make it easy for you to get from one end of the City center to the other with stops in-between. Look for the bus stops that display the shuttle logo (green). The Sydney city route number is 555. Phone: 131 500 for the latest info. Nestled between the City Business District, the Rocks, the Opera House and the Royal Botanical Gardens, it is a main transport terminus for Sydney ferries, trains, buses and taxis. From here you can visit historical Parramatta, Sydney Olympic Park, Darling Harbour, Taronga Zoo by ferry via the ever beautiful Sydney Harbour. Multitude of Harbour Cruises available. Northern end of the Sydney Central Business District. The historical building of Customs House has a large 3d map of the city of Sydney in the floor. Built over 150 years ago, it played in important part in the development of the city. Complete with a library, places to relax and eateries. Situated strategically in the middle of Sydney Harbour, this fort was a key part of the 1800s defense network of Sydney. Originally known as Pinchgut Island, this was the punishment place for recalcitrant convicts who misbehaved during the very early days of the colony. Bookings are essential, tours can be booked at Cadmans Cottage located at The Rocks, Circular Quay. Government House was constructed between 1837-1845. It is the most sophisticated example of a Gothic Revival building in New South Wales. Still used for vice-regal functions. Tickets available at gate for tours (only). Over 30 hectares with more than 7500 trees from all over the world. Located on the harbour, it was established in 1816 to help the settlers and farmers understand their new environment. Rose gardens, a tropical glasshouse pyramid and rare threatened plant species. Building commenced in 1868 (the first burnt down) with its spires completed in 2000. There is a beautiful Melloco Brothers mosaic floor in the crypt, inspired in part by the book of Kells depicting the story of Creation. College St, opposite Hyde Park. 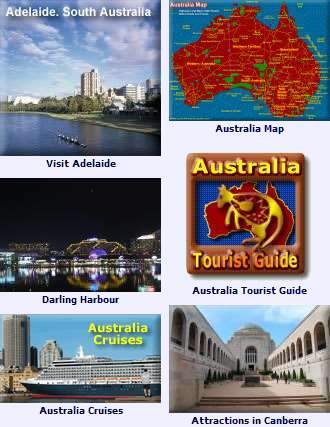 View the city - from the harbour to the Blue Mountains in the west, the ocean in the east and Botany Bay in the south. Dining available in two revolving restaurants. 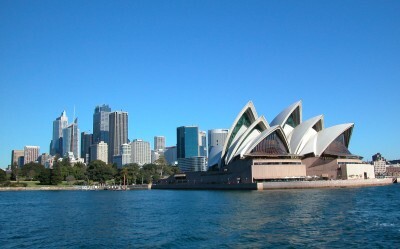 World famous Sydney Opera House with a harbour backdrop features more than great photo opportunities. Plays, Operas, Orchestras, Jazz, or take a tour of the building’s facilities. The Mint has an interesting collection of historical items including the coining press used during the gold rush days. The Rocks is a restored historical district just across the cove from the Sydney Opera House. See The Rocks Attractions. Darling Harbour, just a 15 minute walk west from the city has plenty to see and do, with a number of Sydney’s best attractions: See the Darling Harbour Attractions. See the Sydney City Map of Where to Go, What to See and Places to Visit.